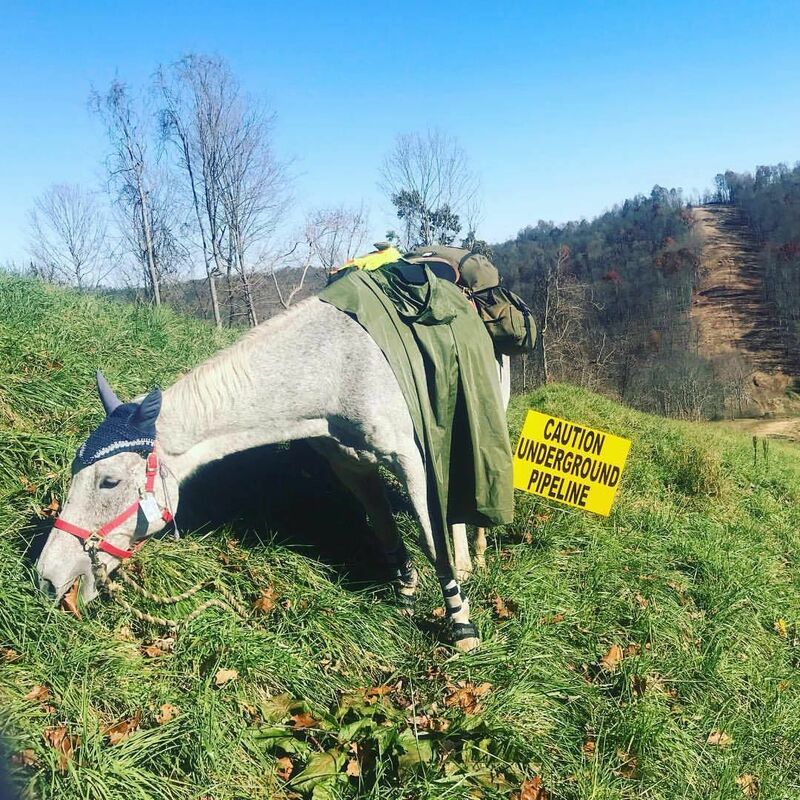 Sarah Murphy, of Afton, and her 24-year-old horse Rob Roy set out on an adventure in September to ride part of the Atlantic Coast Pipeline route. They just arrived home on Wednesday and Murphy reflects on a journey of hardships, beauty and building relationships. Murphy, 35, grew up in Augusta County outside of Staunton. She graduated from Fort Defiance High School and attended Blue Ridge Community College, Piedmont Virginia Community College and received a Bachelor of Fine Arts from James Madison University. She became active in the anti-pipeline movement after riding horseback from Bridgewater to Whitesburg, Kentucky to protest mountaintop removal. Seeing devastation on that trip motivated her activism as well as the pipeline’s path through local counties. 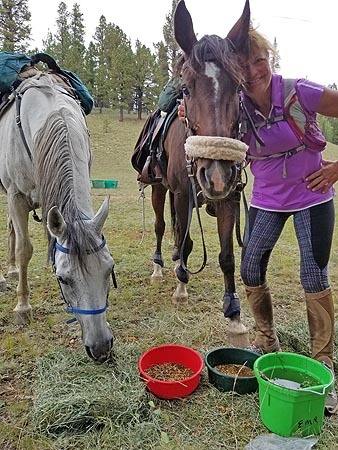 Darolyn Butler patrolled the airport perimeter atop Navajo, an Appaloosa used to train riders for long-distance endurance races. 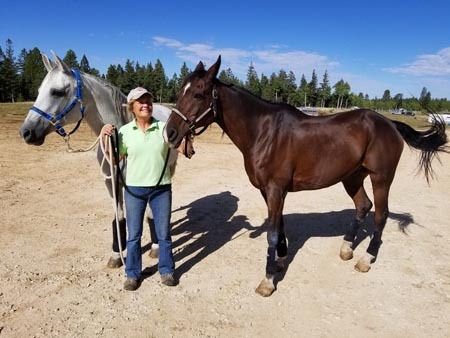 Next to her was Kelly Baber and two of his horses, Ben and TL Mr. Roan Apache — “Patch” for short, because the breeding quarter horse is missing an eye. But less than perfect vision didn’t deter him on this recent morning. 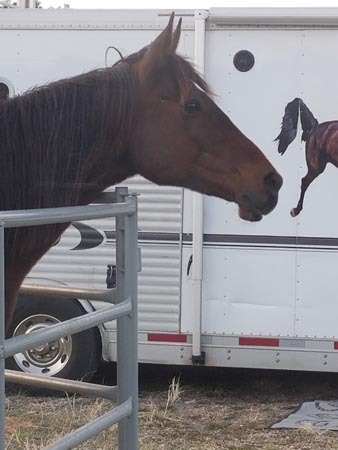 The horses and their riders were looking for wildlife hazards, such as holes where critters could crawl beneath the fence and onto a runway, and for the more worrisome human hazards. 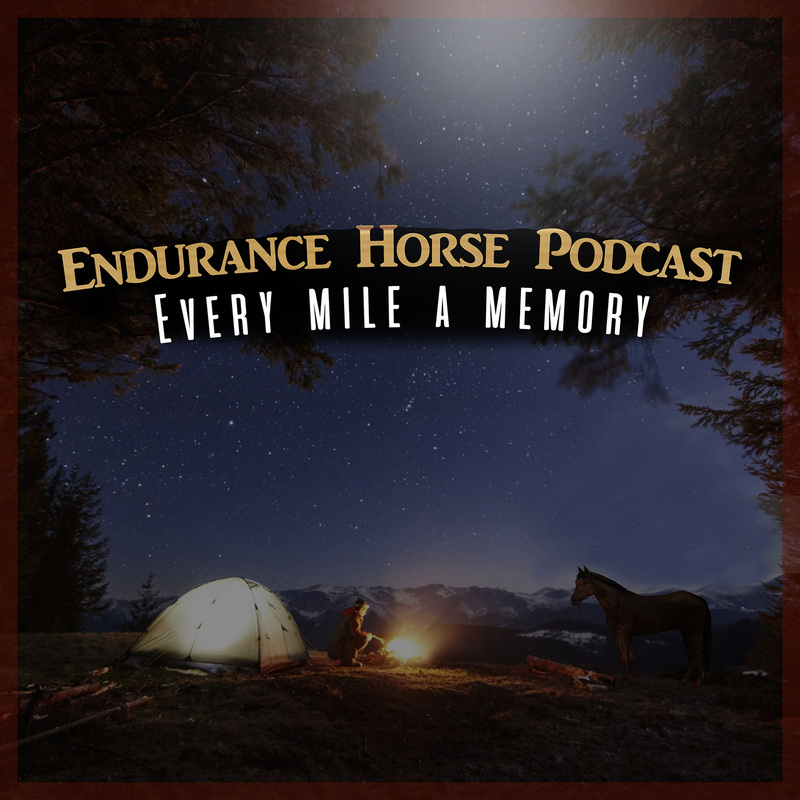 Hello and Welcome to Endurance Horse Podcast! I’m your host, Christina Hyke, an equine photographer in Southern Wisconsin. Occasionally you will hear Jim, my husband, along with me during the intro or outtro of the podcast. This is the last episode of 2018! Featuring: Bridget Helms, Tara Leroy, Jenny Chandler, Lindy Griffith, Keisha Wood, Daryl Owen, Courtney Krueger, Ella Bunting, Leah Cain, Carrie Baris, Sylvia Ireland, Laura Hayes. 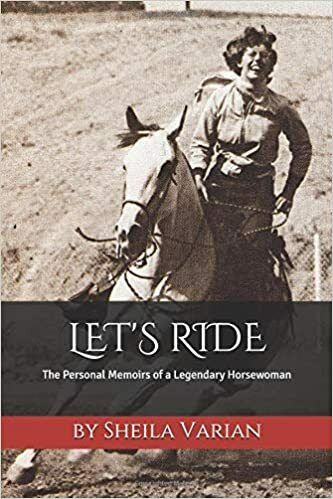 From winning one of the equine world’s most prestigious world championships as a young schoolteacher to leading the way for importing horses from communist-run Poland, Sheila broke through glass ceilings and paved new paths that made her one of the most beloved figures in the equine world. These stories – personally written by her before she passed away – are a collection of her most poignant memories. Like all trendsetters, the journey is, at times, filled with fear, self-doubt, and loss. Sheila’s enchanting storytelling – one of her most beloved attributes – transports the reader into every scene in a way that only she could do. You’ll feel the struggle alongside our heroine. But you’ll also laugh often, feeling the joys, the triumphs, and the reconciliations throughout her incredible journey. Most of all, you will see a canvas of truth lift off each page that speaks to the formidable combination of courage, conviction, humor and grace for leading the ultimate life of fulfillment and purpose. Bonus materials include never-before-seen handwritten poems and letters between Sheila and her parents, handwritten documents, personal photos, and more! Available on Amazon.com and VarianArabians.com. First 500 orders placed through VarianArabians.com below will receive an officially numbered copy! 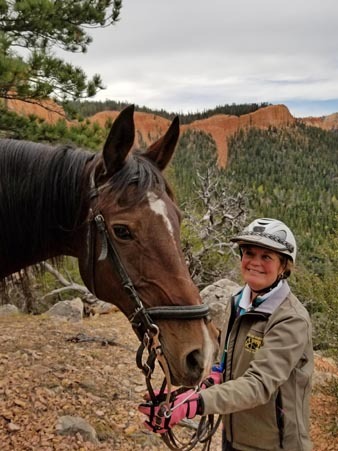 After riding thousands of miles on horseback, Montanan makes pit stop in N.M. 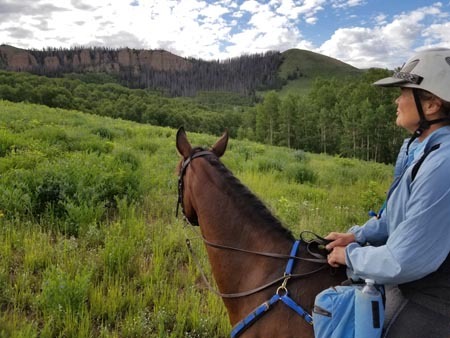 The Montana resident, whose long-distance horseback trips — sometimes up to 600 miles a month — gave rise to the book Lady Long Rider, stopped in Santa Fe this week as part of a book tour and remembered her initial visit to New Mexico with sweet nostalgia. 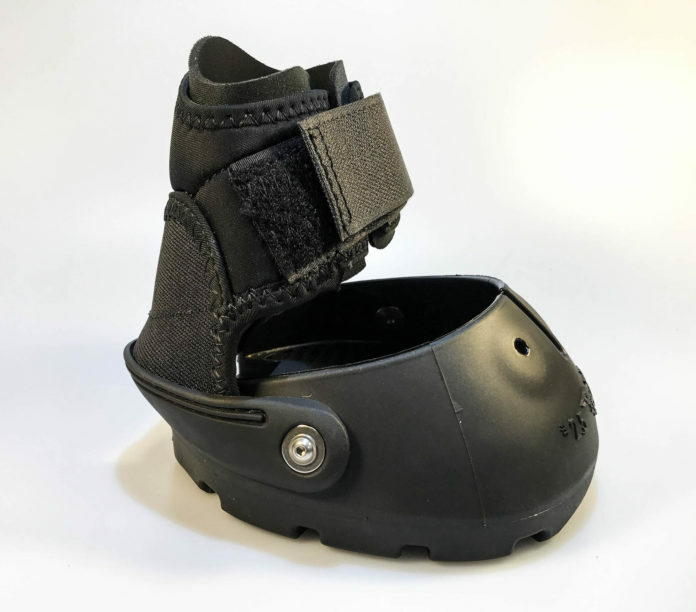 EasyCare has decided to name our new hoof boot line the Easyboot Fury after an Arabian gelding that has not only been an inspiration for a new kind of endurance boot, but has been part of the innovation team by putting in hundreds of trail-tested miles over the last 10 years. Fury has been testing EasyCare hoof boots since 2009 and has completed 32 endurance events with 16 Best Conditions and 12 first place finishes. Matthew Page Mackay-Smith, renowned pioneering equine veterinarian, medical editor for EQUUS magazine, and competitive endurance rider and lifelong foxhunter who located and mapped the colonial roads of Clarke County, Virginia, died on December 8 at Godfrey House in Berryville, Virginia. He was 86. The son of author, prominent horseman, and National Sporting Library founder Alexander Mackay-Smith and his wife, Joan Higginson Mackay-Smith, Matthew Mackay-Smith was born on September 15, 1932 in Washington, DC. He attended the Stuyvesant School in Warrenton VA, then St. Paul’s School in Concord, NH, from which he graduated in 1949. He went on to Harvard University, where he earned his bachelor of arts in 1953. He received his degree in veterinary medicine from the University of Georgia in 1958, and went on to earn a master’s degree in orthopedics and epidemiology from the University of Pennsylvania in 1960. He was the first large animal intern at the UPenn School of Veterinary Medicine, where he taught for seven years. In 1967 he founded the Delaware Equine Center in Glasgow, Delaware with partners Lawrence Cushing and Daniel Marks. The practice later moved to Cochranville, Pennsylvania. With Marks, Dr. Mackay-Smith pioneered a host of surgical and diagnostic procedures that remain standard in the field, including the now universally-used “tie back” procedure for the common equine respiratory disorder laryngeal hemiplegia. Drs. Marks and Mackay-Smith were also the first to use a rigid endoscope to film the workings of the equine larynx, a major breakthrough in diagnostics. Mackay-Smith was an institution on country roads, motoring between his clients’ barns in a battered BMW on which he put 500,000 miles, driving it to such a state of exhaustion that his mechanic refused to let him use it anymore, “lest a front wheel part company with the axle,” wrote Mackay-Smith’s wife, Winkie. Between 1961 and 2001, Dr. Mackay-Smith was the author/co-author of twenty-two professional papers and lectured widely on a host of equine veterinary subjects. He joined the American Association of Equine Practitioners in 1961 and served on the organization’s Ethics, Racetrack, Education, Prepurchase, and Farrier Liaison committees. In 1977, while maintaining his medical practice, he became Medical Editor for the newly founded EQUUS magazine. A born wordsmith who had adapted to a childhood stutter by amassing a massive vocabulary to give him alternate words to use when stuck on one, he was lauded as a superb editor and mentor to many writers. His impeccable veterinary expertise helped establish the magazine as a perennially award-winning, indispensable guide for owners, trainers, and riders. He often said that while his clinical veterinary career was “dedicated to saving one horse at a time,” at EQUUS he embraced the opportunity to educate a wide range of horsemen about equine disease and management so that they could improve not only many horses’ lives, but provide better outcomes for veterinary treatment. He retired from veterinary practice in 2001, and from EQUUS in 2007. Nearly 30 years ago — in the Arabian Horse World January 1983 issue — we interviewed endurance rider Dave Nicholson, who was named to AERC’s Hall of Fame in 1997. Congratulations to the Directors-at-Large who will be representing the AERC membership, beginning on March 9, 2019. Here they are, in alphabetical order. On this month’s Endurance episode we chat with AERC National 100 Mile champion Hannah Johnson, Dr. Melissa Ribley gives us a preview of the 2019 National Championships being held on the West Coast and Mary Howell has some great tips for new Endurance competitors a.k.a Green Beans. USEF could be facing over $1.5 Million dollars in annual revenue losses if the Arabian Horse Association (AHA) decides to self govern or join other breeds considering an exit from the over regulated “Federation”. (AHA) the largest non-Olympic breed organization with approximately 12,000 USEF members held it’s National Membership Convention last month, and voted unanimously (according to insiders) to begin a feasibility study that could result in an exit from USEF governance within 12 months. Endurance riding is the equestrian sport that includes controlled long-distance riding/racing. The sport has existed for more than a century in various forms. 100-mile trail ultramarathons, especially the Western States Endurance Run, Old Dominion 100, and Vermont 100 can trace their roots to endurance riding. Other trail 100s that emerged in the 1980s were also influenced by endurance riding practices. Ultrarunners should feel indebted to those of the endurance riding sport who had the vision to establish some early 100-mile trail races for runners. The trail 100-miler inherited many of the same procedures of aid stations, course markings, trail work, crews, medical checks, and of course the belt buckle award. Once ultrarunners understand their history, a common kinship is felt between the two sister endurance sports. 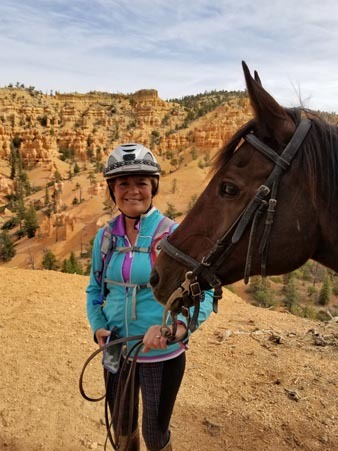 So trade in your running shoes for horse shoes for a few minutes and learn about an inspiring and adventuresome endurance riding history that impacted the sport of ultrarunning. 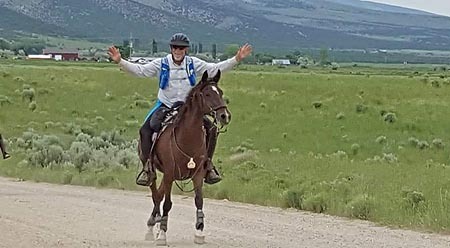 Usually the credit for establishing the endurance riding sport is given to Wendell Robie of Auburn, California when he initiated the Western States Trail Ride (Tevis Cup) in 1955. (That history will be covered in Part 2). But endurance riding competitions of various formats existed long before 1955. Vermont must be recognized as the birth place for the endurance rides in America. Distance Nationals is heading back to Alanna & Gunnar Franks Ranch in Vinita, Okla. from October 25-27. The American Saddlebred Registry (ASR) will join our growing list of partnered breeds, which include: the Appaloosa Horse Club (ApHC), Paso Fino Horse Association (PFHA), Performance Shagya-Arabian Registry (PShR), American Morgan Horse Association (AMHA), and the Akhal-Teke Association of America (ATAA). Remember, along with all of the National Championships offered, there are multiple Open Owl Hoot 25 Mile LD’s and 50 Mile rides along with an Open Owl Hoot 100 Mile ride and a CTR. These Open rides do not require qualifications or membership and are open to any breed. At 19, Fire Mt Malabar has over 7000 miles, 16 first places, and 47 Best Conditions (3rd on the all-time BC list). And he's not done yet. 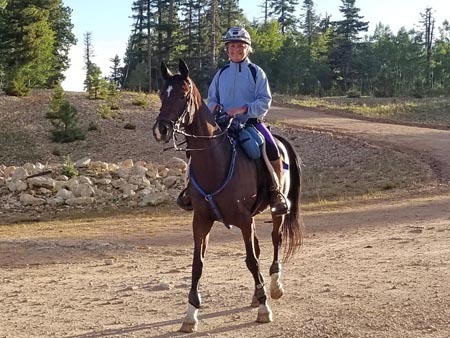 The 16-hand, slight bay gelding with a star and thin strip and 4 white socks is a familiar sight going down the Northwest and Mountain region endurance trails. But you might do a double take at his rider. Lee Pearce of Baker City, Oregon, was Fire Mt Malabar's (almost) exclusive Heavyweight rider since 2006: a partnership of over 5300 miles, 43 Best Condition awards, and a 2011 National Best Condition award. 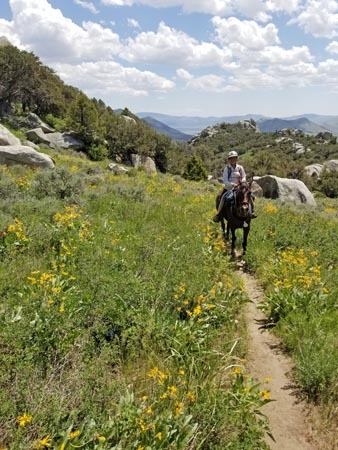 In 2015 Malabar and Lee headed to the Big Horn 100; they started the ride, and passed the first vet check, but then Lee stopped with him out on the trail because something wasn't right. Turned out Malabar had contracted salmonella, most likely at an overnight stopover in Dubois on the way; he became so ill that they nearly lost him at the vet clinic. He went on to recover, and Lee and Malabar came back firing on all pistons in 2016, with a 10 for 10 record, though Lee rode him more conservatively. Now it's Lee's wife Naomi Preston who has the esteemed seat in Malabar's saddle. How she got there was a process of talking Lee out of him, since he had another nice and talented horse to ride (JAC Winterhawk), and since Naomi didn't really have a main endurance horse. "Maybe it was pity that he gave me Malabar," Naomi laughs. Naomi had ridden Malabar on only one previous 50 mile ride in June of 2011 at the Owyhee Cheap Thrills No Frills in Idaho. "It was a magical ride. Sue Hedgecock and I rode together the whole day. [Sue rode LZP Julioslastchance, her eventual Haggin Cup winner.] It was pretty, there were wildflowers, blue sky; the two of us just had a ball. And we decided to tie for the win, because the horses were even. It was really fun." Naomi had never ridden Malabar before, and the gelding was perfect that day, since Lee had gotten the 'kinks' out of him in winning the previous day's 50. "Malabar's showing no signs of slowing down," Naomi says. "It's almost like he's got a second career. We got 4 wins and 4 Best Conditions this year. We tied for the win of the 3-day Strawberry Fields Pioneer with Lee and Hawk - only 3 pairs did all 3 days. Very tough ride. And Malabar reached 7000 miles in September. "We weren't pushing or anything - Malabar's just kind of on fire. He's just going so well, and his recoveries are great." 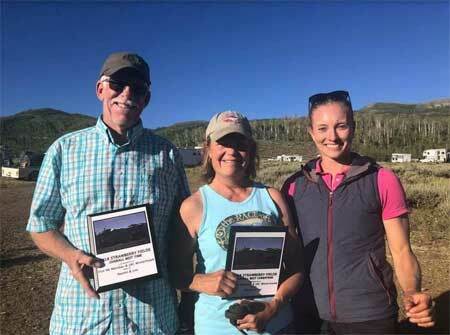 On one of those wins this fall, Naomi and Malabar tied with Christoph Schork and GE Pistol Annie at the Outlaw and the Virgin Pioneer ride in Utah. Christoph is AERC's winningest rider, and you can usually expect Christoph to be setting a smart pace at the start of rides and finishing in front. And GE Pistol Annie is no slouch, with 48 completions in 49 starts, 33 of those first places (all with Christoph), and 21 Best Conditions. Naomi says, "We came into the lunch vet check, and I thought, well, if Malabar doesn't pulse down right away, this will be a sign he's going too fast. And they both pulsed down at the same time; Malabar of course drops to 40. Christoph and I rode together the whole day, and we had a ball." Naomi recalled that Lee and Malabar had ridden with Christoph and Pistol Annie many years earlier. One can easily imagine the two experienced, talented endurance horses eyeballing each other in mutual recognition down the trail. Known in his 'younger years' for some antics - spooking, bucking, going too fast - Malabar tried his tricks on Naomi just once, on her first ride with him in 2017 at City of Rocks. "We were going down a long road, and something spooked Malabar, and the wind was blowing a million miles an hour, and he took off at a gallop. So not only did he spook, but he bolted, too. Lee was thinking I was going to be roadkill, but I stayed on, and got him stopped. "That's the only time he's really ever done anything kind of crazy with me. I was really fit and strong then. I wasn't getting off that horse. Luckily he just ran straight. But it did scare me! "He's really settled down. I love riding him. It's just fun. We're in that zone. He reminds me a lot of riding Mustang Lady in several ways, just because he's a veteran, he knows to eat and drink, he carries a steady pace - he knows all that stuff. You know how nice it is riding a horse that's experienced." (Naomi's phenomenal Mustang Lady entered the AERC Hall of Fame in 2001 - read about her here). Experienced and, still, on fire. Malabar probably is getting a 'second wind' with a Lightweight rider, but it could just be that he's that good. He comes from some of the best old-time, proven bloodlines you can find in the endurance sport: Fire Mt Malabar is by Jim and Jackie Bumgardner's legendary endurance stallion and sire Sierra Fadwah (AERC Hall of Fame 1992) out of Malabar Dawn, by Malabar Amir. 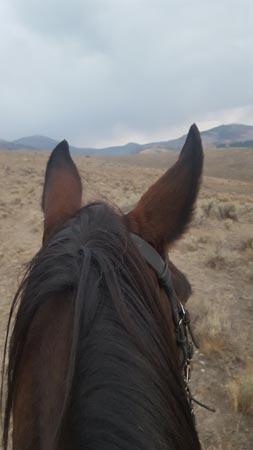 While the gelding is (mostly) all business on the trail now (mostly, unless Naomi tries a side pull on him after a lunch vet check at a ride, which he does not like), he can throw in a little crow hop on training rides. "It's not anything that you'd fall off," Naomi says, "but a crop hop that says, 'I'm feeling good!'" Generally kind of aloof to people, Malabar still knows he's quite special, coming to the pasture gate when Lee or Naomi are around, to get let out for his "special" meals. He thinks any hay on the ground is his bed. He has a bit of a sense of humor, too, taking advantage of Naomi when she's trying to put his bridle on. He puts his head in the sky because he knows that he's tall and Naomi is short and can't reach him when he does that. The only horse in the herd he can't push around is his brother Fire Mt Legacy. Malabar knows how good he is. And he's not done yet. Lee and Naomi are planning on more multi-day rides next year, which Malabar excels at. "Lee and I really love multi-days. And we really love the Duck rides (Dave Nicholson's multi-day XP rides). The trails are beautiful, we get to see different scenery, and the camaraderie is great. "Malabar's just that special quality of a horse that knows their job, and has fun doing it and you don't have to worry about them. It's just the ultimate. "It's a blessing - really a blessing."